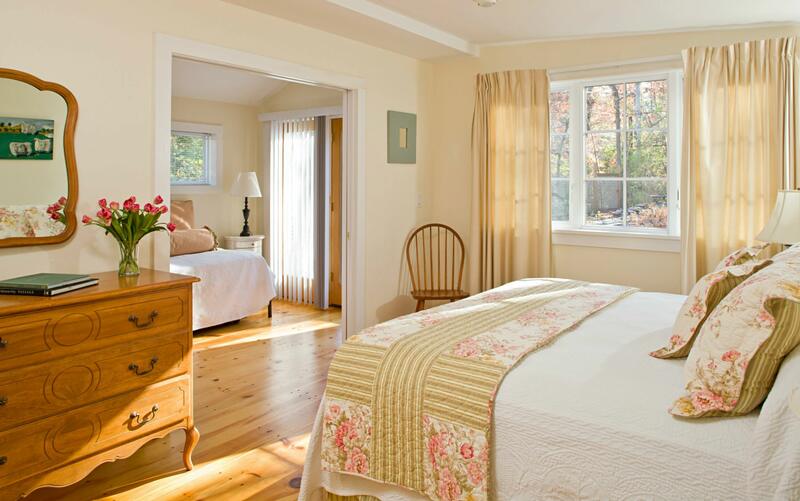 All rooms in our Woodstock, New York bed and breakfast include access to the grounds, cable TV, free Wi-Fi access and superior beds and linens. Room prices are based on double occupancy. $20 for each additional person over 10 years of age. We fully comply with the law regarding access for service animals, but please contact us directly at 845-679-8211 or info@woodstock-inn-ny.com to book, as only certain rooms can accommodate pets. Click here for a printable version of our room comparison chart. Option to golf at a beautiful, local and private “members only” club for a green fee only. We look forward to having you for a romantic getaway to The Woodstock Inn on the Millstream. Private baths with shower, includes breakfast, free wi-fi, cable. Private bath with shower, writing desk, television, wet bar, free wi-fi, cable, electric fireplace, sitting area, includes breakfast, free wi-fi, cable. Faux fireplace, writing desk, built-in armoire, tiled bath with glass shower. Electric fireplace, two-person spa tub with skylight, kitchenette with fridge, dining area, includes breakfast, free wi-fi, cable. Two-room cottage. electric fireplace, two-person spa tub, two-person tile shower, kitchenette and dining table. Includes breakfast, free wi-fi, cable. Vaulted ceiling, kitchenette, private back patio, tiled bath with tub/shower combo, includes breakfast, free wi-fi, cable. Opens onto patio, dining area and kitchenette with stream views, electric fireplace, pull-out sofa, includes breakfast, free wi-fi, cable. Private cedar porch overlooking the Millstream, soaking bubbler tub, two-person tiled shower, kitchenette, electric fireplace, includes breakfast, free wi-fi, cable. Vaulted ceiling, deep-soaking tub, kitchenette, includes breakfast, free wi-fi, cable. Two-bedroom apartment, tiled bath, includes breakfast, free wi-fi, cable. Private deck, kitchen, king master, private bath with bubble tub, second bedroom has queen bed and upstairs loft. One-bedroom, 1 1/2 bath vacation rental. Galley kitchen, breakfast nook, living room, fireplace, TV, sitting room with daybed, private patio. Lovely tubs, jetted tub in master, deck, patio, gas fireplace in the Great Room, wooded pathway, daily housekeeping.